We’re shellabrating World Turtle Day at New England Wildlife Center! World Turtle Day began in 1990 as an annual observance to help people learn more about how they can help protect turtles and tortoises and their habitats worldwide. And turtles in Massachusetts definitely need our help! Six of the 10 native turtle species found in Massachusetts are listed under the Massachusetts Endangered Species Act. At New England Wildlife Center and our affiliate Cape Wildlife Center, our vet team is actively contributing to turtle conservation efforts in Massachusetts. The team regularly treats many species of injured terrestrial, aquatic and marine turtles, as well as cares for displaced hatchlings. NEWC is also a partner in Zoo New England’s Grassroots Wildlife Conservation (GWC) Headstart Program for Blanding’s turtles. The vet team has been caring for a Blanding’s turtle since last fall. When the turtle was first brought to the Center, she was about the size of a quarter. Today, she is bigger than a fist and the vet team will soon release her back into one of the sites where GWC is monitoring the population of Blanding’s turtles. JULY 2018 UPDATE: The Blanding’s Turtle NEWC’s veterinary team has been caring for is now back in the wild! Why Do Turtles Need Help? 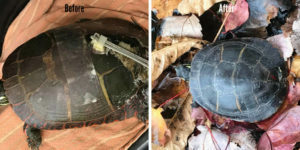 A combination of habitat loss, pollution, and getting hit by cars or caught in fishing netting has impacted turtles in Massachusetts in general. Some species like the Blanding’s turtles have additional problems too – they take 10-20 years before they reproduce. Baby turtles are also frequent prey to mammals and other reptiles. As Dr. Rob Adamski, New England Wildlife Center’s wildlife veterinarian, explains, “baby turtles are like reptile chicken nuggets—snacks for toads, raccoons, and foxes.” He adds that their small size is why conservation efforts such as the Blanding’s turtle headstart program are so important. Worldwide the pet trade has jeopardized turtle populations in their native habitats, including Massachusetts. When non-native and native turtles kept as pets are abandoned in the wild, they can cause harm to the local environment and the state’s wild native turtles because they can carry diseases. Non-native species can also disrupt the ecosystem and many will not survive in the Massachusetts’ climate. 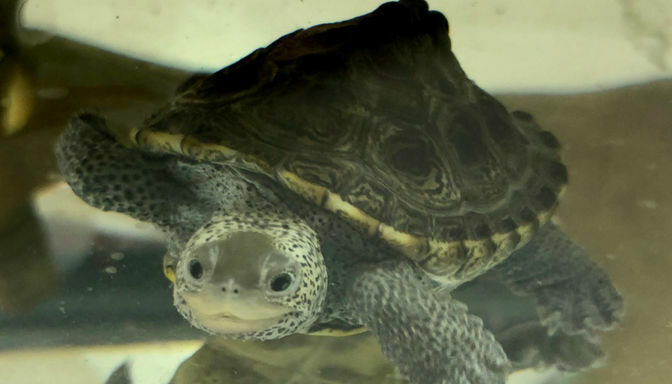 How Do Turtles Help the Ecosystem in Massachusetts? Turtles play an important part in the ecosystem and the food web which couldn’t be replaced. Marine turtles help maintain healthy seagrass beds, which are a prime environment for small fish. On the beach, they help spread and fertilize seeds (i.e., everybody eats, everybody poops) for grasses which help prevent beach erosion. Aquatic turtles that live in ponds, bogs, and marshlands also help maintain the balance in the ecosystem. Some species such as the common snapping turtle are important aquatic scavengers and predators, others help to manage plant growth by spreading and fertilizing seeds. They are also a food source for other wildlife. Dr. Adamski says most of the turtles brought to New England Wildlife Center have cracked shells or other trauma to their shell, most likely from getting hit by a car. A turtle’s shell is like bone and can regrow back together given assistance with stabilizing the break and time to heal. Over the winter, the vet team also cared for common snapper, spotted, and painted turtle hatchlings found too close to be safe to roads, parking lots, and industrial areas, as well as a baby diamondback terrapin found on a construction site. Because they were found in the late fall and did not have time to prepare to brumate, a.k.a. the turtle equivalent to hibernation, the hatchlings all stayed at the wildlife hospital through the winter and spring to give them a chance to grow larger. The vet team will return all of the hatchlings to local habitats over the next few weeks. Shellabrate Turtles With A Visit To NEWC! NEWC is open to the public 10 am to 4 pm, 7 days a week. Our indoor turtle garden, observation windows into the wildlife hospital wards, and education turtles in our Weezie Nature Center give you the opportunity to see local species conservation work in action! To learn more about visiting the center, visit newildlife.org/visit-the-center.